The strong deformation forces can encourage cracks in the tower foundation and penetrating moisture can lead to long term damage. 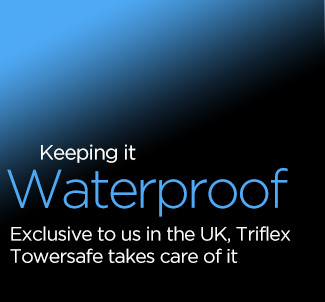 ABR Roofing are the only UK company offering the Triflex Towersafe waterproofing system specially developed for wind turbines. A flexible fleece reinforcement ensures permanently elastic system properties. The liquid nature of the Triflex Towersafe system allows upstands and folds and even complex details, like the tower flange, to be sealed, leaving no seams or joints. The wind turbine operator gets a quality technical solution of the highest standard. If you would like to find out more about our Windfarm Base Waterproofing service give us a call anytime and we'll be delighted to give you more information.